Book with Confidence. See photos of guest rooms and common areas of our Huntington Beach hotel and look before you book. 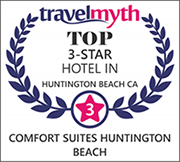 Book your stay directly with Comfort Inn and Suites Huntington Beach and save. Located in the heart of Orange County, California, Comfort Inn and Suites Huntington Beach provides guests with convenient access to area’s major attractions, premier events, and shopping and dining. Find everything you need when you visit Huntington Beach, California, from local attractions to bars, restaurants, and even nail salons. If it's in Huntington Beach, you'll find it here. Enjoy the comforts of home when staying in any of our air-conditioned guest rooms at Comfort Inn and Suites Huntington Beach. Spacious and comfortable rooms with free WiFi, plush bedding & modern amenities. 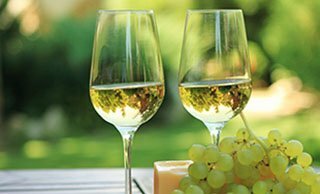 The Comfort Inn & Suites Huntington Beach Hotel is your premier Orange County hotel for corporate travel, family vacation, or romantic getaway in sunny southern California and the Los Angeles area. Our Huntington Beach hotel is perfectly situated near Huntington Beach pier and miles of breathtaking Pacific beachfront. The Comfort Inn & Suites Huntington Beach Hotel is just minutes away from many of the area attractions including Disneyland, Downtown Disney's Garden Walk, Knott's Berry Farm, The Queen Mary, Universal Studios Hollywood, and much more. The Comfort Inn & Suites is your place to stay when traveling to Huntington Beach. 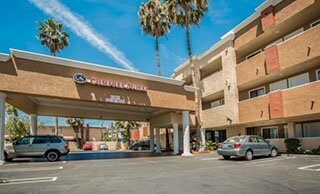 Our Huntington Beach hotel is just 10 miles from John Wayne Airport, 11 miles from Long Beach Airport, and 30 miles from Los Angeles International Airport (LAX). No matter what type of hotel accommodations you're looking for in and around the Huntington Beach area, our Comfort Inn & Suites Huntington Beach hotel is committed to making your stay a memorable one. The Comfort Inn & Suites Huntington Beach Hotel offers a number of elegantly designed Theme Suites with balconies, sofa beds, and champagne. The Huntington Beach hotel packages we offer are second to none and provide you with great savings during your visit. In all of our amazing hotel suites, you'll find coffee makers, refrigerators, microwaves, irons and ironing boards, hair dryers, massage shower heads, and luxurious pillow-top mattresses. All of our guestrooms are ADA Defined service-animal friendly. All the comforts of home and more are available at our Comfort Inn & Suites in Huntington Beach. Our Huntington Beach hotel offers more than many area hotels around Orange County. We strive to provide the best for every guest that stays with us and continually improve our offering to keep them coming back. If you are a business traveler searching for Huntington Beach hotels, you will find all the essential tools for your needs at our Huntington Beach Comfort Inn & Suites including complimentary use of our business center, fax and copy service, voice mail, and complimentary high-speed Internet service. Our Disneyland hotel treats you to plenty of full-service amenities that will make your stay memorable, including a variety of complimentary amenities; such as, our popular SAVORY STARTS breakfast, complimentary wireless high-speed internet access, free parking in our parking lot, weekday newspapers, fully-equipped fitness center, and beautiful heated pool and spa. Our Comfort Inn & Suites in Huntington Beach, CA is just minutes from a variety of area attractions that are perfect for everyone from toddlers and teens to adults and seniors. A few of the most popular Hunting Beach attractions include all Orange County beaches, Disneyland Resort, Downtown Disney's Garden Walk, Knott's Berry Farm, The Queen Mary, Universal Studios Hollywood, Orange County Performing Arts Center, Bella Terra Shopping Mall, Southcoast Plaza, and The Block in Orange. For corporate travelers, our Huntington Beach hotel puts you within close proximity from a number of venues including The Anaheim Convention Center, The Orange County Fair and Event Center, Catalina Convention Center, and Boeing & General Dynamics. Our Comfort Inn & Suites hotel in Huntington Beach offers you everything you need while visiting Disneyland and all of the surrounding attractions. Choose the Comfort Inn & Suites Huntington Beach hotel for your next southern California visit. Huntington Beach, California is located along the beautiful Pacific Ocean with easy access to a number of sandy beaches, a number of Los Angeles attractions, and nearby businesses and event centers including The Anaheim Convention Center, The Orange County Fair and Event Center, Catalina Convention Center, and Boeing & General Dynamics. Huntington Beach is one of the most populated cities in Orange County and is most known for it's approximately 10 miles of sandy beaches, excellent climate, beach surroundings, and surf. 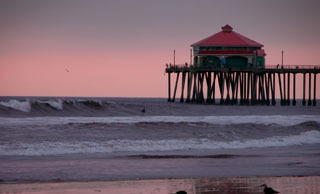 Huntington Beach consists of award winning seafood restaurants, amazing nightlife, and abundance of shopping. While visiting Huntington Beach, come stay in one of our spacious, clean and comfortable suites at the Comfort Inn and Suites in Huntington Beach, California. 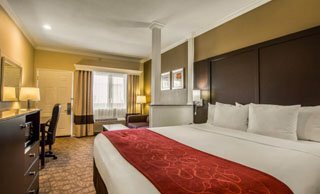 This website is maintained by Comfort Inn and Suites Huntington Beach, a licensed user of certain proprietary trademarks and service marks of Choice Hotels International, Inc.